This is my effort for No Croutons Required, a monthly blogging challenge hosted by Jacqueline of Tinned Tomatoes. This is the first time I’ve taken part in this particular blogging challenge, hopefully it won’t be the last! This month’s challenge was to use jarred anti pasto in a soup or salad. More often than not I usually have a jar of sun dried tomatoes on hand so I didn’t have to buy any special ingredients to make this recipe. I use the word “recipe” loosely, this is one of those dishes that could be adapted in so many ways depending on what you wish to use! 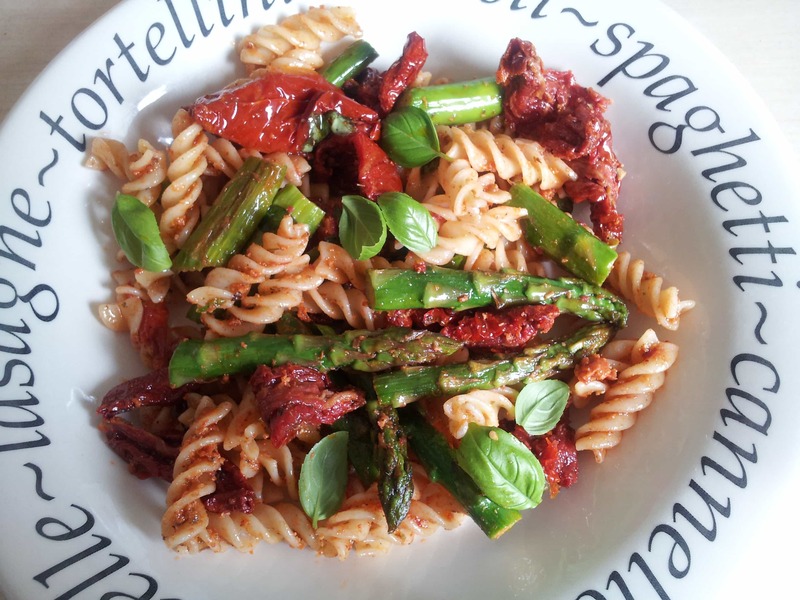 Asparagus & Sun dried tomato pasta salad – serves one hungry person for lunch/dinner! This looks super. I love asparagus!